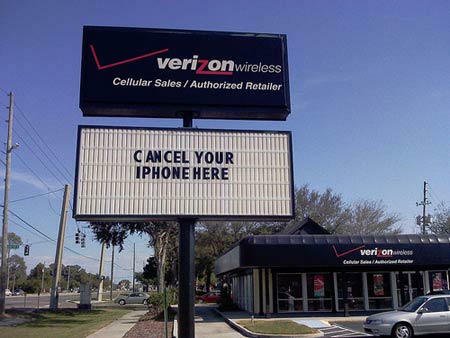 In certain corners of the Internet, it has become received wisdom that the iPhone will appear on Verizon any time now. Timelines are speculated upon. AT&T’s rampant incompetence is cited. And then Apple announces another must-have product that only works on AT&T’s network in the U.S. So, in case you’re wondering, the iPhone 4 isn’t coming to Verizon in September. It’s not going to T-Mobile (in spite of what some misinformed analysts think, it’s still not 3G-compatible) or Sprint, either. This is understandably frustrating, as every U.S. iPhone user has, at one time or another, experienced complete AT&T meltdown — full bars but no connectivity, battery life dropping at more than a percentage per minute, and dropped calls every few steps. But the sad fact is, AT&T was and is the only credible partner for Apple to work with on the iPhone and the iPad. And the reason for that has very little to do with the United States and everything to do with the rest of the world. They’re stuck together until everyone goes 4G. AT&T is the Only Legit GSM Player in the U.S.
Why is that? Here’s the issue, and it’s one that gets glossed over all too quickly in much of the press: the iPhone is a GSM platform. GSM, standing for global system for mobile communications, is the standard that the vast majority of the world’s phones run on. How vast? There are 4.3 billion GSM customers in 212 countries. That makes it, without exaggeration, the single-most successful consumer electronics market in the history of the world. Radios and TVs don’t have that degree of penetration. Every other mobile standard (and there are several), is tiny by comparison. If you’re making just one model of phone, GSM is the only thing that makes sense. You can have Verizon, or you can have Europe, Latin America, Africa, India, and much of Asia. The numbers are easy. Apple, though it’s rarely reported to be such, is actually fanatical these days about operational efficiency when it comes to its manufacturing and sourcing. Though the company spends years prototyping a new product before even announcing it, once they have a product locked in, they like to keep it as streamlined as possible. Every single Apple product is hardware-identical worldwide. An iPod here is an iPod in India. And that mentality has carried over to the iPhone and now the iPad. To reach global markets, make global products. For that reason, choosing to go GSM and in the spectra it did was the only thing that made sense to Apple’s product planners at the outset. The only real markets that aren’t dominated by a compatible form of GSM for iPhone 4 today are Japan, South Korea, China, and the non-AT&T carriers of the U.S. Together, working loosely, let’s assume that we’re talking about a potential reach of 2 billion total customers (approximately the world’s population less GSM users). Does it make sense for Apple to make an additional model of the iPhone? Maybe. Just not for T-Mobile, Sprint, or Verizon. You see, all of the non-AT&T carriers combined only constitute about 200 million potential users, any of whom could switch to AT&T if they could put up with its crummy service. And it couldn’t just be one phone. Sprint and Verizon (150 million or so users) are compatible with each other and a couple of Canadian networks, but neither works with T-Mobile. In fact, T-Mobile’s 3G standard is so obscure that only two of the smallest players in Canadian mobile also use it. They got screwed over by the FCC. Contrast that with China. China Mobile is the world’s largest telecom company with more than 500 million customers running on the proprietary TD-SCDMA standard, a really wacky network that nonetheless makes up a huge plurality of the non-GSM networks in the world just by nature of China’s vast scale. For that matter, Japan and Korea are each dominated by mobile companies whose user bases dwarf Sprint and Verizon’s. And making a phone just for those markets wouldn’t alienate a powerful existing network partner like AT&T. Apple probably should make a China-only edition of the iPhone. There’s big money to be made there, and the limited penetration Apple has mustered through China Telecom, the GSM player in the market, is proof that there’s more money to be made than its universal phone approach has yield thus far. And the iPhone 4 does offer a few additional 3G bands that could make it work on NTT DoCoMo, the notoriously closed #1 network in Japan. Saved by LTE? Not For At Least Another Year. Probably Three. In the big picture, the U.S. market is smaller than the rest of the world. Quite a bit smaller. And that’s why the current AT&T alliance holds and will hold until the world rolls out its 4G network around the emerging LTE (Long Term Evolution) standard. Both AT&T and Verizon are going with LTE (while Sprint is currently trying to figure out whether to stick with WiMax or get on board), and it’s a foregone conclusion that, at some point in the not-too-distant future, Apple will introduce an LTE iPhone that works on both AT&T and Verizon, and the vast majority of networks worldwide. It will be amazing. It will also probably be some time in the somewhat distant future. Verizon claims it will launch its LTE network this fall, but there’s no way it will be ready for most consumers or markets until a year or more after that (it should go faster than Sprint’s WiMax rollout, however). AT&T’s timeline is even more vague, and given its slow movement to roll out 3G, I don’t think we can expect them to have a credible LTE network before 2013. Worse, remember that you’re dealing with Apple here. The original iPhone launched with EDGE only because Apple said the 3G ate up battery life too much. Multiply that effect for LTE. Though its battery life is better than WiMax, it’s going to be worse than current 3G. I don’t think there’s any way we’ll seen an iPhone on Verizon before 2012 and far more likely 2013. I wish it could be otherwise. It just won’t be. You can disagree with Apple’s reason for not making iPhones for markets that can’t use its one model. But you can’t look at the numbers and say they don’t add up. Bottom line, the U.S. is going to continue to have the worst iPhone network in the world until the whole country goes 4G.